Curious, mutually appreciative acquaintances became determined co-conspirators, and the result is an album that’s brash and, quite literally, brassy. Byrne and Clark spin their intriguingly enigmatic tales, by turns whimsical and dark, backed by a large brass band in lieu of a traditional rock lineup. There is a magical urbanity to Love This Giant: It’s as if they’re dancing in the streets, their voices soaring over the rhythms, the melodies, the barely contained cacophony of the city. Though Byrne and Clark each have an unmistakable sound and persona that have made them such compelling performers on their own, their voices manage to blend naturally, effortlessly, here. Sometimes they trade verses; at others they sing in unison. Like friends who can finish each other’s sentences, when one takes the spotlight alone, it’s often with words that the other provided. The brass lends the songs an appealing theatrical sheen while programmed percussion provides a contemporary feel. 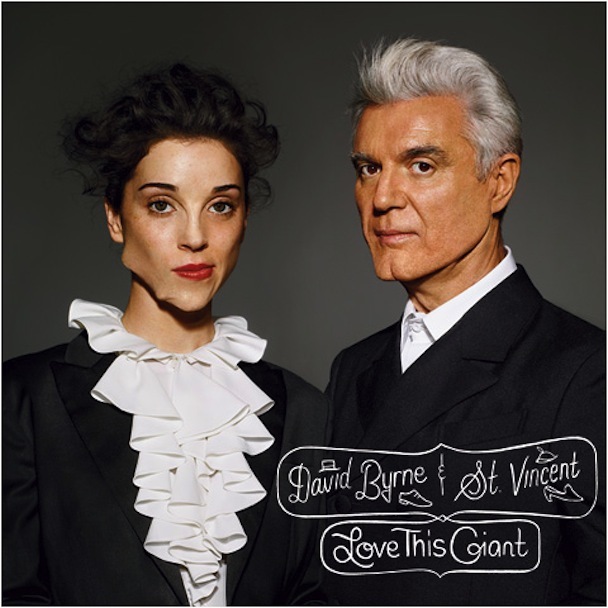 The inventive arrangements have clearly sparked some remarkable vocal performances—check out Byrne on the syncopated I Should Watch TV or Clark on the grand Optimist. Though there’s no overarching theme to Love This Giant, surreal images of nature dominate the lyrics, most of which were worked on in tandem by Byrne and Clark. The threat of natural disaster promises an emotional epiphany; urban apocalypse gives way to a garden party."